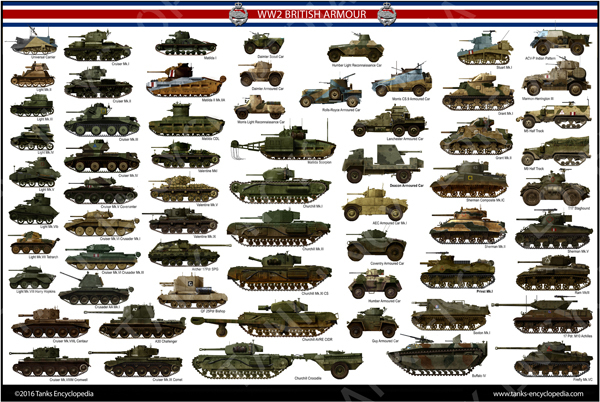 In the early 30’s, the British army was mechanizing its units around the concept of armored divisions. 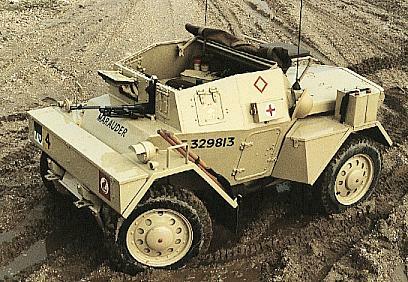 One of the vehicles required to equip the new formations was a small 4×4 scout car for general liaison and reconnaissance duties. It was requested in 1938 by a British War Office specification and a call to manufacturers. Three prototypes from Morris, BSA and Alvis were presented in August-September 1938 and began a testing campaign. All three were relatively similar, with a rear engine, roughly the same size and layout, with four independent suspended wheels. The initial Morris prototype was quickly eliminated because of insufficient speed. The Alvis model (called “Dingo”, an Australian wild dog) had a higher center of gravity, thus some lateral stability problems in sharp turns, but was fast off-road (up to 50 mph/80 km/h). The BSA Cycles Ltd prototype was ready later in September, and performed particularly well, performing a 16,000 km (10,000 mi) test course with almost no notable issues. In the meantime, the War Office requested better protection and an armored roof. This required a return to the factories, where the suspensions were strengthened and a more powerful engine was fitted. Presented once again, it was chosen, over the Alvis. The first order of 172 units came in May 1939, under the designation “Car, Scout, Mark I”. In turn, BSA turned to one of its companies, Daimler, to polish the design for production. Although Alvis lost the competition, the prototype name eventually became popular and stuck to the model. 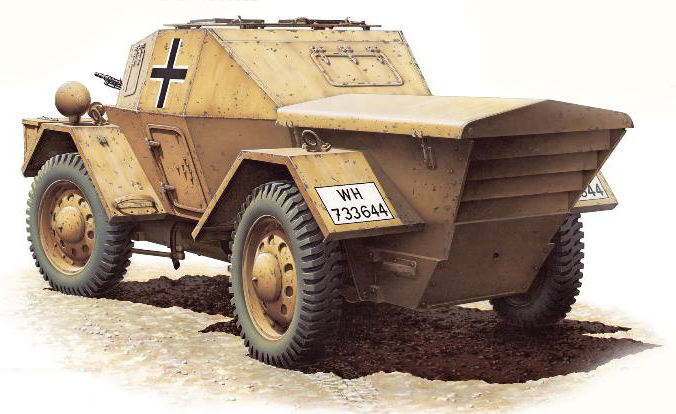 The Daimler Dingo was one of the finest armored cars ever produced in Great Britain. 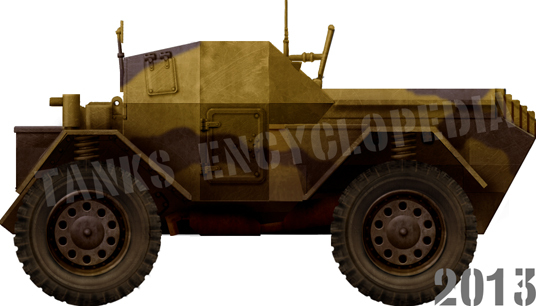 The Dingo was a small two-man armored car, relatively low and wide enough to have the required stability for fast off-road rides. Its initial armor was thin, just enough to withstand infantry ordnance. 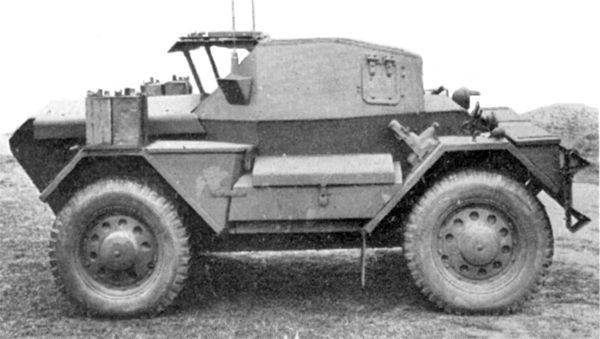 At the Army’s request, it was thickened, reaching 30 mm (1.18 in) on the front nose and glacis. Deflecting armored sloped panels were welded all around the central framework. The front driving compartment had four openings hatches. The engine was the regular Daimler 6-cyl 2.5 l 55 hp (41 kW), fed by a 300 l (79.25 gal) gasoline reserve (two tanks), which gave an incredibly long range for its small size. The transmission consisted of a pre-selector gearbox, fluid flywheel, five gears forward and five gears reverse, allowing steering with all four wheels. This feature gave the Dingo a very tight turning radius, only 7 m (23 ft). However, the system was tricky to master for inexperienced drivers, so a more conventional design of front-wheel steering only was chosen on the Mk.II. The design of the transmission was optimized for compactness, centrally positioned, with the prop shaft running on either side. During the course of wartime production, it appeared that the flat bottom plate, which allowed the crossing of uneven ground, was highly vulnerable to mines. The rubber tires were of the run-flat semi-solid type, so no spares were carried, but their toughness was compensated by the massive vertical coil springs, to give a smooth ride (about 8 in/20.3 cm of vertical deflection). There was a swiveling seat next to the driver, for a machine-gun servant/radio operator, equipped with a N°19 wireless radio set. The base armament was a removable cal. 0.303 (7.7 mm) Bren gun, with a dozen spare magazines. This armament could be swapped over for a heavier Boys antitank rifle (0.55 in/14 mm). This gave the vehicle, which was fast and well-protected, with a good engine and low profile, a real advantage against all sorts of light vehicles, making it excellently suited for reconnaissance and liaison missions. The whole series is remarkably homogeneous. It was produced from 1939 to 1945, and remained virtually unaltered. The Mark I had a flexible sliding roof and the all-wheel steering. It was difficult to handle for inexperienced drivers. The Mark IA was a sub-variant equipped with a folding roof. The Mark IB had a reverse cooling air flow and new armored grilles for the radiator, allowing better ventilation. The bulk of these vehicles served in the Libyan desert. The Mark II had a revised steering system, using only the front wheels. The lighting equipment was modernized, altogether with the Mark IB modification range. The Mark III was the final version, coming in 1944 with a waterproofed ignition system and no roof at all. 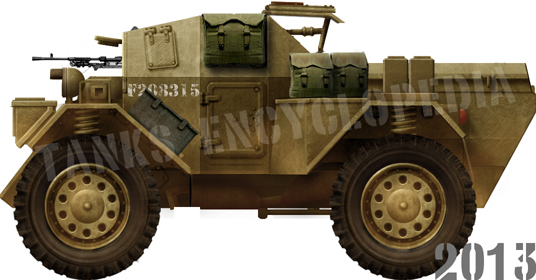 The Dingo was first used by the BEF (British Expeditionary Force), with the 1st Armored Division and 4th Northumberland Fusilers, in April-May 1940. 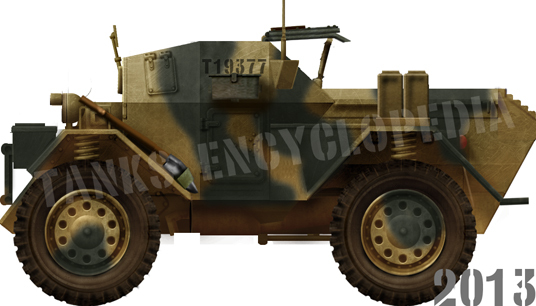 The main users were small reconnaissance units from the cavalry corps , which consisted generally of two Dingoes and two Daimler armored cars for support. 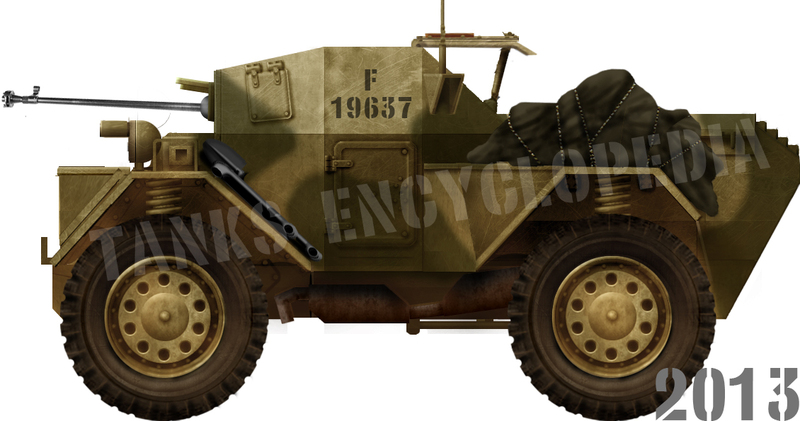 The Dingoes served on every front alongside many Allies armies (Australian, New Zealand, even Polish and Free French Forces), and were so proficient that no replacement was sought before 1952, when the Daimler Ferret appeared. 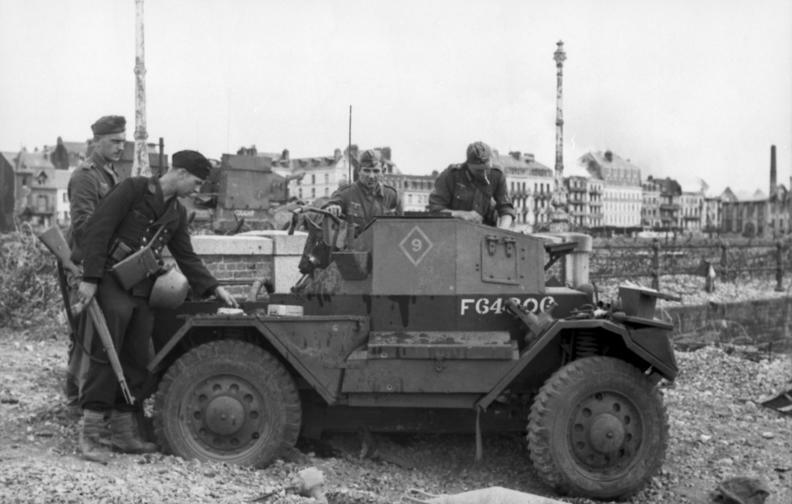 They served as reconnaissance vehicles, but also as mobile observation posts and with Royal Engineer units, used for locating minefields and bridging positions, and HQ liaison vehicles. They were generally highly praised by officers of all ranks, which tried to have them as their personal liaison and command vehicle. 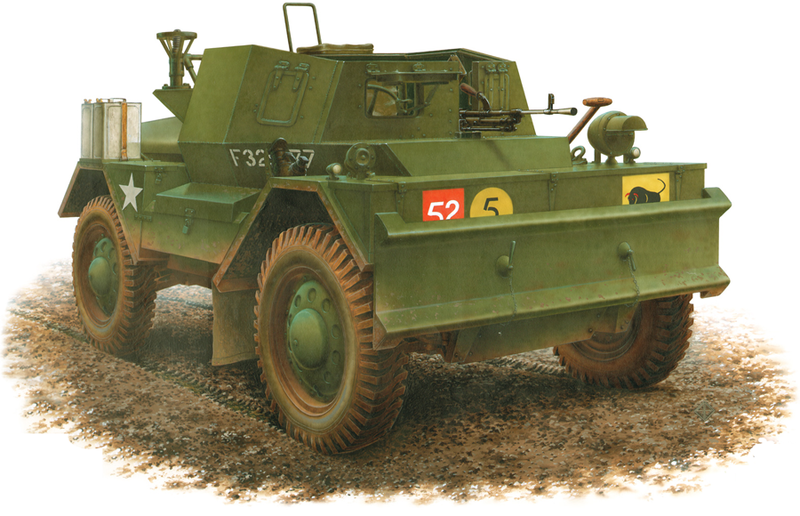 Fast, reliable, nippy and quiet, this vehicle was probably one of the most successful British AFVs of the war, perfectly suited for its tasks. In the mid-70s the Dingo was still used by Cyprus, Portugal and Sri Lanka, and many were available in official depots, and later army dumps. Now it’s a highly praised collector or reenactment vehicle, sometimes reconstructed almost from scratch. 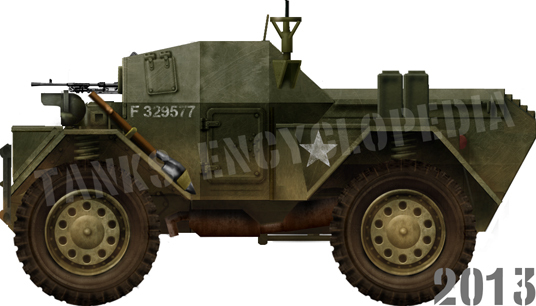 When the Dingo was only a prototype, Birmingham Small Arms, the designer, thought it had a considerable potential and made an excellent base for the development of an up-armed model, then called a “wheeled light tank”. A pilot model was started in April 1939 and, after trials and acceptation, production started in December 1939. It was bigger, wider and taller, with an armored turret housing a standard 2-pdr (40 mm/1.57 in) QF gun. 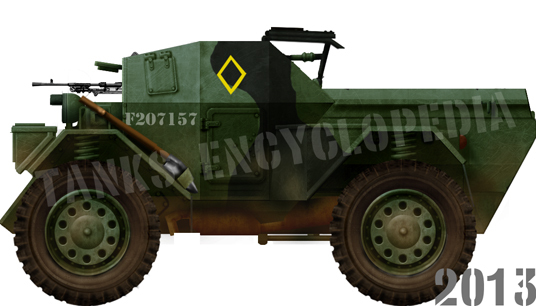 In all, 2694 would be built until 1945, and these vehicles often cooperated with Dingos in recce missions. When the demand exceeded the capacity of Daimler, Ford Canada, in Windsor Ontario, begun production of a local derivative. 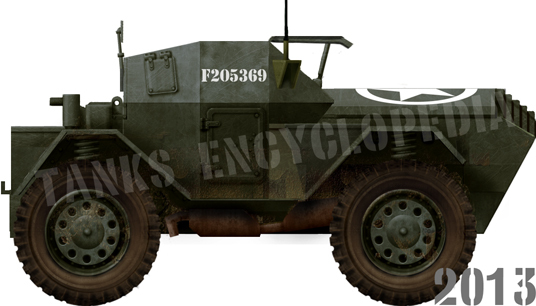 The “Scout Car, Ford Mk.I”, also called the “Lynx armored car”. Almost identical, it was one foot taller because of the Ford transmission. The Ford engine was more powerful, but both the transmission and suspension were inferior to the Dingo’s. In all, 3255 will be delivered from 1943 to 1945. As the Dingo was starring in the desert, the Italians were impressed enough, after capturing one, to devise their own model, the “Lince”. 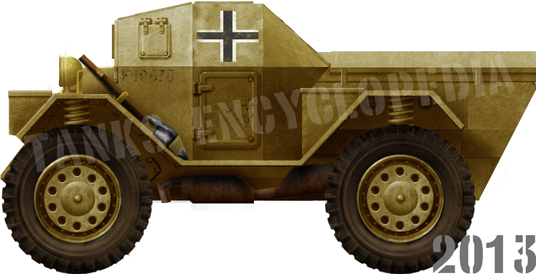 It was literally a clone, produced to an extent of 230 to 250 vehicles between 1943-44, also used by the Germans after the Italian capitulation, as the Panzerspähwagen Lince 202(i), performing the same missions. Captured Dingo Mk.I, designated Leichter PzKpfw Mk.I 202(e), DAK, Libya, 1941. 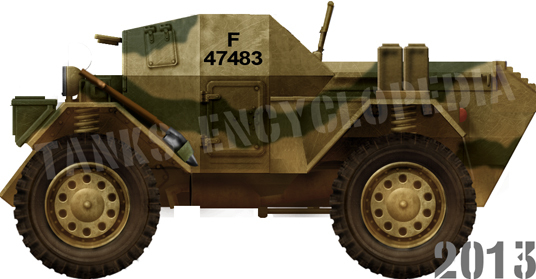 Dingo Mk.IA, British Expeditionary Force, 3rd RTR, 1st Armoured Division, Holland, summer 1940. Dingo Mk.IA from the HQ squadron of the 1st Northamptonshire Yeomanry, 20th Armoured Brigade, 6th Armoured Division, training in Great Britain, 1941. Dingo Mk.IA, Libya, fall 1940. 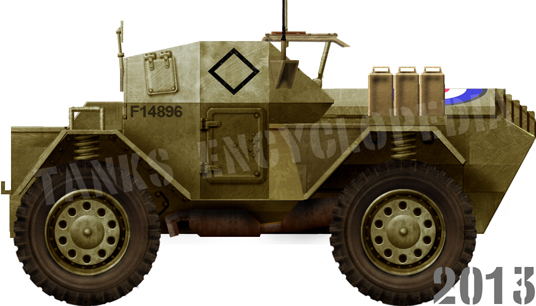 Daimler Dingo Mk.IB, Great Britain, fall 1941. Dingo Mk.II, unknown reconnaissance unit, Western Europe, 1944. Dingo Mk.II, 4th Field Squadron RE, 7th Armoured Division, Libya, 1942. Dingo Mk.II attached to the reconnaissance battalion of the 7th RTR, VIIIth Army, Libya, fall 1942. Dingo II, 2nd NZ Division HQ, El Alamein, November 1942. 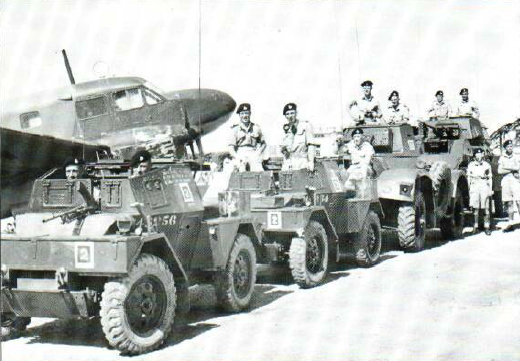 Dingo Mk.II, NZAC training center near the Red Sea, 1945. 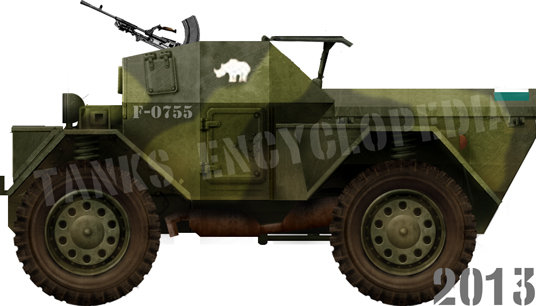 Dingo Mk.II, 11th Hussards, 7th RTR, Holland, winter 1944-45. 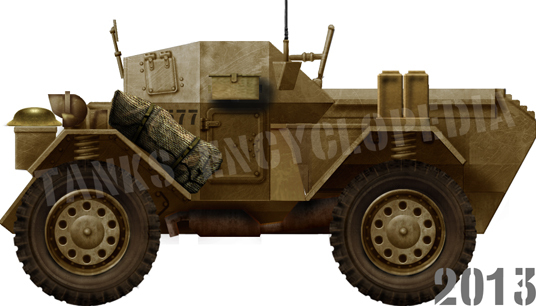 Dingo Mk.III, 11th Armoured Division, Holland, winter 1944-45. Outstanding. Do you have any info on whether the Australian 8Th Div. had the Dingo’s in Malayisa?